Saying that there was "clear and convincing evidence" that the city of Memphis actively pursued covert surveillance of four local activists, U.S. District Judge Jon P. McCalla decreed on Friday that the ACLU of Tennessee could sue the city of Memphis for breaking a 1978 agreement prohibiting the city from conducting such activities. From McCalla's decision: "The Court finds that the ACLU-TN has demonstrated by a preponderance of the evidence that it was the entity that entered into the 1978 agreement with the City. Thus, the ACLU-TN has standing to bring the lawsuit." 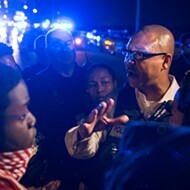 McCalla's ruling came as a result of an August trial to determine whether the ACLU had legal standing to pursue a lawsuit on behalf of local activists Elaine Blanchard, Keedran Franklin, Paul Garner, and Bradley Watkins, who claimed they had been illegally spied upon by the Memphis Police Department and other city agencies. * The police department conducted “political intelligence”as specifically defined and forbidden by the consent decree. * The department operated the Office of Homeland Security for the purpose of political intelligence. * The department intercepted electronic communications and infiltrated groups through the “Bob Smith” Facebook account. * The department did not establish an approval process for lawful investigations into criminal conduct that might incidentally reveal information implicating First Amendment rights. * The department disseminated information obtained in the course of an investigation to individuals outside law enforcement. * The department recorded the identities of protest attendees for the purpose of maintaining a record. The judgment is available in PDF form here and goes into great detail about specific activities conducted by MPD and the city in their efforts to spy on local activists and their groups. Surveillance was conducted against activists from Save the Greensward, Black Lives Matter, and other groups, and photos were taken at several marches and protests. Details of the city's surveillance operation begin on page 20 of the attached document.